Outgoing BNTU President Luke Palacio was president during three consecutive terms in the past nine years. 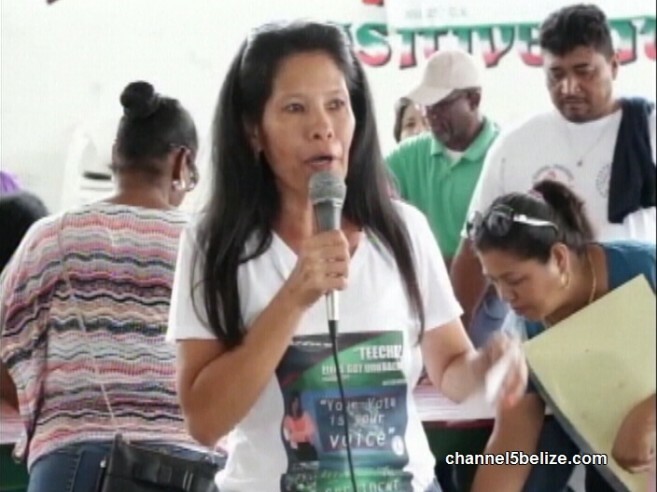 Smith has been an active contestant in the BNTU’s “Stand up for Belize Campaign”, which was followed by the notable 11-day strike in October 2016. Smith also assumed the role of Senator for the unions in January 2016, and has played an active role of the Senate Inquiry into the Immigration and Nationality Department. Smith said she is happy to fulfill her new role as BNTU president. “I think the first word I must say is ‘grateful’ and I am overjoyed…. I had…confidence, but I wasn’t sure, because you never know. People will say to you that they will support you, and when the day comes, you never know what they do. So I wasn’t overly confident, but I was sure of my members from my branch,” said a grateful Smith. After attempts to become BNTU president in the past, Smith stated that she has gained more experience over the years. “Well, I feel that the extra years that I took to qualify myself helped me. The members of the BNTU have seen where I have grown, and say, ‘you know what, Elena Smith is about BNTU and not about any politics.’ I think that is what pushed me over the edge today,” said Smith. Smith shared her plans to improve the union. “I think we need to be moving with the times. We see our young people-our young teachers-are into technology. As a union we must become like that as well, so that we can benefit them. So my focus will be education and communication,” said Smith. She also indicated that she will spend time educating BNTU members of their rights. Smith clarified that she plans on carrying on the work of the BNTU in its entirety. “First of all there is no ‘Luke Palacio regime’. It is the BNTU, and it is the members’ say as to what our President and the council will go by. My plan is to continue to work with our members and to do what they want. When I need to stand for them, I will do that. When I need to work for them, I will do that. But it is not about me or Brother Luke, it is about BNTU, and our members. They will tell us how to go about doing their business,” said Smith. The election was almost postponed by 21 days, due to accusations of political interference with Smith by the Government of Belize. However, as Palacio hosted an emergency meeting with all the union branches, members began to spontaneously sing the union’s anthem: “We shall not be moved!” Thus, the election was only delayed by two-hours, with Smith winning by a landslide. To assist the execution of Smith’s duties, outgoing BNTU president, Luke Palacio, was uncontested to serve as the BNTU’s first vice president. Meanwhile, Jorge Maheia was re-elected as the national treasurer, and Ruth Shoman is the national secretary. Palacio’s presidency ends on Friday, June 30th, and Smith takes on her new position on Saturday, July 1st.